Glad that i’m not the only person in the world that suffers terrible headaches (mostly from banging my head against the table) while trying to decipher the BES admin manuals…. No problem, I am glad you found it. Please post back and let us know if it worked for you. 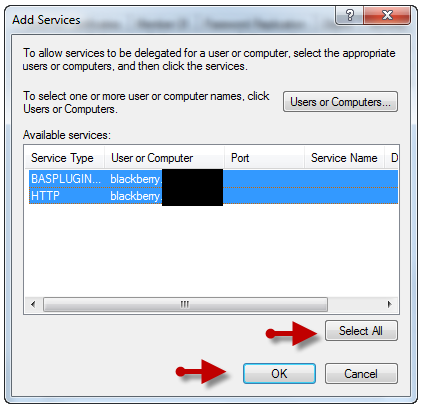 I try activate SSO for BlackBerry device users to access intranet (http://s1-univ-url.compagy.lan/bes) using BlackBerry devices without requiring the users to type a user name and password each time the access the intranet sites. I configure the BlackBerry MDS connection service to support Integrated Windows authentification. But I was able to do for Intranet websites is to just have the domain pre-entered during login, the user has then to enter the password if he has checked to remember the username, but haven’t achieved single sign-on. From what I’ve read this is not possible expect if you follow the other KB article that prompts you to delegate access to a site which in my case is not really applicable since we are talking about many sites (http://docs.blackberry.com/en/admin/deliverables/16661/SSO_for_MDS-CS_1086111_11.jsp). To just have the domain pre-entered in the authentication popup but the users then have to enter their password everytime. I tested from computer (Windows 7) in active domain for access to the intranet site (htt://s1-univ-url.compagy.lan/bes) and SSO success (Auto Logon). Why SSO does not work since the blackberry terminal ? If anyone had better luck with AD authentication I would also be glad to hear it please. Active directory (Windows 2003 R2 SP2) forest: Windows 2003 R2. 1. In Microsoft Active Directory, in the Microsoft Active Directory account properties, if the Delegation tab does not display, update the default HOST SPN registrations for the Microsoft Active Directory account sso-bes-srv. Where can I download software. I have a few question, hopefully you can shed some light on this. – Is it necessary to create an administrator account for the AD account set up with spn? – it works without create an administrator account. – By changing the AD authentication login information, will this affect BES logon to the messaging server/Configuration database? – Can we assign the spn to more than one AD account for admins? (i thought the idea behind single sign-on is so that BlackBerry admin can auto login to BAS using their own AD account credential and illiminate the need to enter credentails? Got it all sorted out. The SPN is to be assigned to the BESadmin account, an Administrator account is to be created for each BlackBerry Admin to bypass the need to enter credentails. I need to create a new account with the SPNs on AD and on BES and the use it in the “Microsoft Active Directory login information” at BAS? I get it right? Yes that is what I had done. Create a new AD account, add the two SPN’s to that account. Add that account as an administrator in BAS, then finally enter all that info into the MS AD Login Info section. Given replication of AD maybe simply trying again now that some time has expired will make it work. If not I would double check the everything! Make sure the SPN’s are correctly in there without spaces or typo’s. If we create a new a new AD account to assign the two SPN’s to that account. Does this new AD account require the same rights as the BESadmin account has to Exchange or SQL server that BES connected to? Blue, no that second account does NOT need to have the same Exchange Rights as your standard BES account. Does the AD account dedicated for single sign-on need to have a mailbox? No it does not. It is used just to do the AD lookups. Thank you for these very helpful instructions. I came to the same conclusions as you but glad to confirm them with your experience. And i thought it was just me….. Are these the same instructions required to enable AD authentication for the Blackberry Administration Service web logon? Trawling through Blackberry’s documentation it seems rather difficult to fathom as to how to enable such a simple feature. I wouldnt have thought i needed to dig around in ADSI just to enable LDAP authentication? Can you shed any light on this? By the way great blog. Il be subscribing to your feed. Shawn, ADSI edit is not needed as long as you are using the 2K8/Win7 RSAT tools (AD Users and Computers). You could use ADSIEdit to do the same thing but I find it harder to use with less hand rails. Also these directions will enable SSO for both the end user portal as well as the admin site. Thanks for the great feedback! Thanks so much for the clear, easy to follow instructions! This saved me a ton of time. Thank you very much Eric, great post! Aty last, I’m in the same boat at you. RIM support is somewhat not super great. They never figured out how come my SSON wasn’t working. I simply followed your steps and tada! it worked. Thanks alot and shame on RIM…. Thanks a lot for this. I did everything according to the instructions, but SSO didn’t work. After one hour research, I found that RIM has noted in one of their docs that it doesn’t work if the browser is on the same machine as BAS. So I started the browser on a different machine… and it worked! Thanks for the added info Sandra, I will add that to the post. Glad I was able to help! SSO will work in the BES server or a remote workstation as long as you login to the server / workstation using the AD account that has Administration rights to the BAS console. Great article. You description of RIM is great and now I am sure there are many other users with the same experience. One Question – Running SSO for the BAS work pretty great, but I never had the MDS working with SSO e.g for connecting to an internal website. Did you realize that? RIM is searching for two month with no results. You are god to us. Thank you very very much. THANK YOU for this. Working beautifully now. Also are you being asked for creds by the browser in a pop up auth box OR are you seeing the standard logon page for BAS? Has anyone been able to get SSO to work with Intranet sites? We are getting prompted for credentials everytime. I have tried multiple things and none seem to work. It should work just fine, I would make sure the site is being classified in the intranet zone and the zone settings allow for automatic authentication. (I know settings it to low will do that) you can also adjust the setting for authentication directly although it escapes me ATM what it is called. I have this narrowed down to our PDC not allowing Kerberos logins. The delegate account I have setup for MDS is trying to login. The MDS log on our server shows the login failed because of the PDC. I am not sure what changed to make the log give me that error (That is a good thing). All previous errors were really cryptic. Sorry not really sure, I would think it has to do with something in the product although maybe related to bad kerberous tickets. I would call T-Support and see if they can be any help. Hi, I install BESX whit Exchange 2010 in same server running windows 2008 r2. The Microsoft® Active Directory® account that you specified is not configured to support single sign-on authentication. You must associate a service principal name to the Microsoft Active Directory account before you can add the account to the BlackBerry® Administration Service.